People have done some really gross things to lose weight over the past two centuries. Please, don't eat tapeworms or baby food to fulfill your New Year's weight-loss resolution. According to Time, William the Conqueror went on his alcohol-only diet in 1087. But rather than losing girth, "he died later that year after falling from his beleaguered steed, leaving his subjects to struggle with finding a coffin big enough to fit the corpulent king." Don't let this be you! Getting around by horse is difficult enough these days, much less doing it drunk. These got more delicious-sounding through the ages, right? The poet Lord Byron popularized the vinegar and water diet in 1820. Byron was anorexic and bulimic and consumed large amounts of water and apple cider vinegar (sometimes also red cabbage), which is said to have caused diarrhea and vomiting. So you might look at this as one of history's first (and least healthy!) cleanses. Scientists agree that drinking vinegar will not lead to weight loss. Invented by Sylvester Graham, this vegetarian diet consisted of fruits, veggies, and limited amounts of dairy, especially butter. Graham also invented the Graham cracker, which was also to be consumed on this diet. 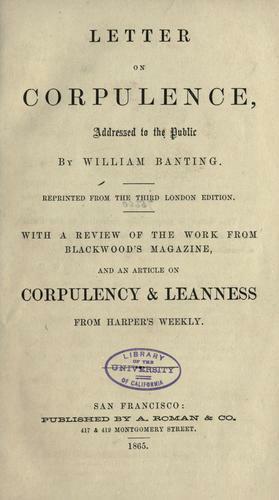 The main point of this diet was to "cure" masturbation, which Graham thought caused blindness. For breakfast, at 9.00 A.M., I take five to six ounces of either beef mutton, kidneys, broiled fish, bacon, or cold meat of any kind except pork or veal; a large cup of tea or coffee (without milk or sugar), a little biscuit, or one ounce of dry toast; making together six ounces solid, nine liquid. For dinner, at 2.00 P.M., Five or six ounces of any fish except salmon, herrings, or eels, any meat except pork or veal, any vegetable except potato, parsnip, beetroot, turnip, or carrot, one ounce of dry toast, fruit out of a pudding not sweetened any kind of poultry or game, and two or three glasses of good claret, sherry, or Madeira — Champagne, port, and beer forbidden; making together ten to twelve ounces solid, and ten liquid. For tea, at 6.00 P.M., Two or three ounces of cooked fruit, a rusk or two, and a cup of tea without milk or sugar; making two to four ounces solid, nine liquid. For supper, at 9.00 P.M. Three or four ounces of meat or fish, similar to dinner, with a glass or two of claret or sherry and water; making four ounces solid and seven liquid. Jockeys, notorious for serious attempts at keeping their weight down, turned to pills that allegedly contained tapeworms in the early 20th century. 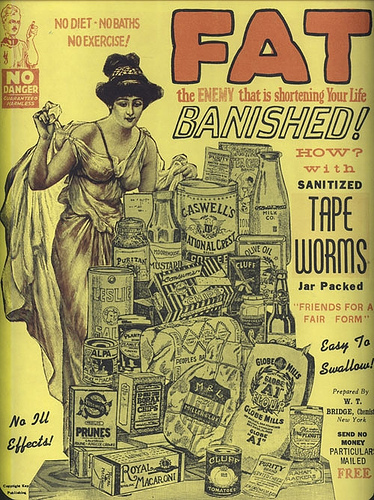 Then in 2009 the tapeworm fad garnered renewed interest when Tyra Banks's talk show featured women who said they'd swallow tapeworms to get skinny. Of course, while tapeworms might keep you skinny on a 6,000-calorie-a-day diet, they are BAD FOR YOU. Please, don't go around trying to ingest tapeworms for vanity's sake. A variation on the low-carb fad, this diet suggests that an enzyme found in grapefruits helps burn fat when eaten with high fat meals containing things like eggs and bacon. It didn't really peak in popularity until the '70s (which is when the ad pictured ran), but grapefruit doesn't really burn fat, so nothing was really lost in that time. Though, why doesn't anyone serve grapefruits with strawberries in them anymore? 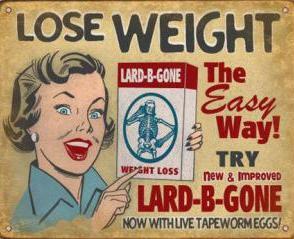 Now don't these sound like a yummy way to get thin? 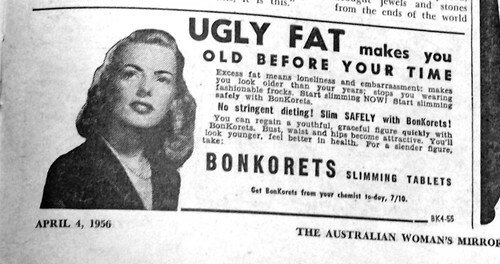 "Excess fat means loneliness and embarrassment." 9. And cleverly packaged canned fruit. This is from the mid-50s. 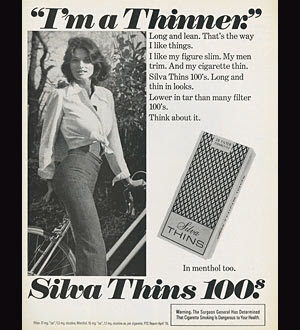 Apparently cigarette companies, wanting to exploit their product as a weight loss aid, added appetite-suppressing chemicals to them in the 1960s. Tartaric acid was one of these chemicals, though they also considered (but did not seem to follow through with) adding ephedrine and amphetamine. 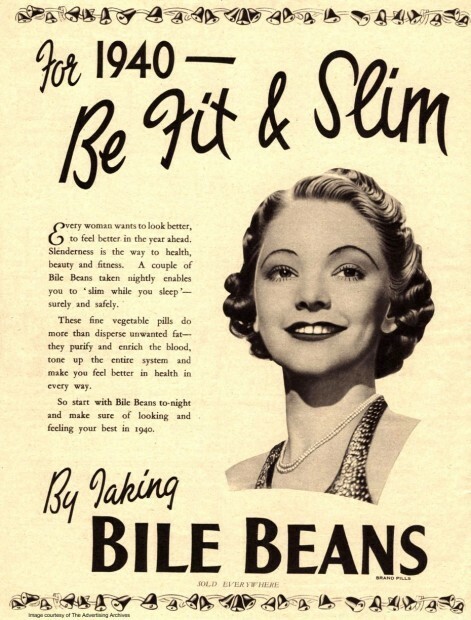 Set forth in a 1961 book by Herman Taller, this diet argued that it didn't matter how many calories you ate as long as you didn't eat any carbohydrates and began each meal with a shot of safflower oil. After the book's publication, the FDA fined Dr. Taller for unsubstantiated claims made in the book, which ruined his reputation. This is an ad for sugar from a 1971 issue of Woman's Day. Artificial sweetener was becoming popular at the time. I can totally see this coming back — if the cookie diet took off there's no reason an "ice cream cone before lunch" diet couldn't do the same. 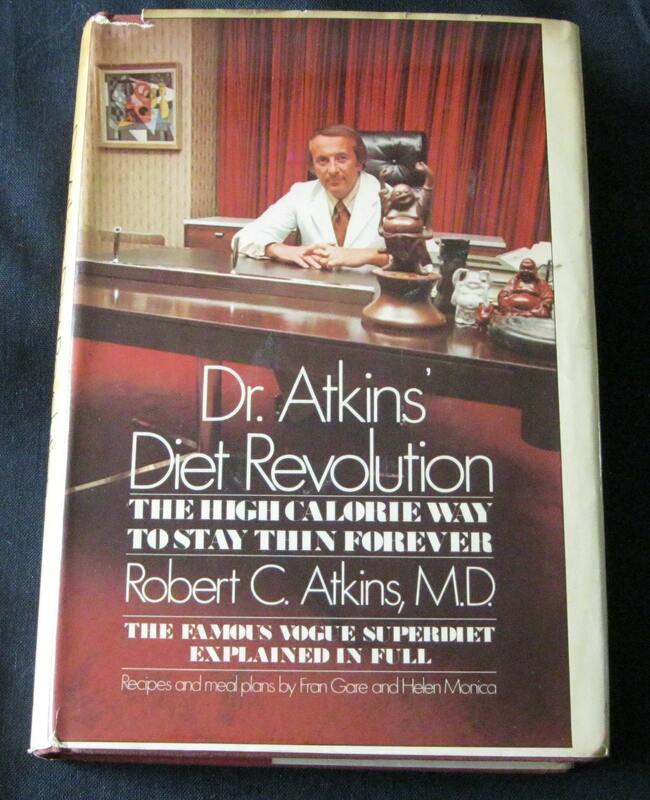 Dr. Atkins published his low-carb plan in a book in 1972. The method became popular again in the mid-'00s, and spawned a number of offshoots, like the Zone Diet and the South Beach diet. The diet is controversial because it advocates eating as much high-fat food as one wants, which studies have shown could lead to heart disease. Started by Beverly Mazel, this diet plan includes eating only fruit for the first ten days. The 1981 book spent 30 weeks on the New York Times bestseller list. Mazel (pictured below) eventually opened a weight loss clinic where she "treated" a lot of celebs. Doctors were highly critical of the diet. The Journal of the American Medical Association published an article in 1981 that read, "The Beverly Hills diet is the latest, and perhaps the worst, entry in the diet-fad derby," noting that excessive fruit consumption can cause diarrhea, dehydration, and in extreme cases, "the blood pressure can drop low enough to interfere with the circulation of blood and the person can die." Clever pineapple-themed marketing would not lead you to think that. Another gross diet that consists of eating mostly cabbage soup. Trainer Tracy Anderson, whose clients have included Gwyneth Paltrow, Madonna, and Lady Gaga, touted consuming baby food as a GROWN HUMAN BEING to lose weight. The diet was linked to a bunch of celebs, including Jennifer Aniston, who was forced to defend herself to People magazine: "I've been on solids for about 40 years now." If your body can handily process gluten and wheat products (meaning you don't have a gluten allergy or celiac disease) you don't really need to be on a gluten-free eating plan. More on that here. If these diets seem silly/nasty to you, imagine how silly and gross all of our current fad diets will look in a few decades.